An Amp, as seen in New Super Mario Bros. 2. 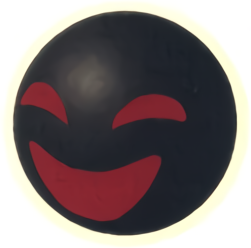 Amps are small, electrified, and spherical metal balls that have appeared as enemies throughout the Mario franchise. Their name stems from "ampere" (often shortened to "amp"), the standard unit of measurement for the flow of electrical currents. 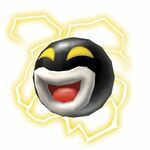 Amps debuted in Super Mario 64 and have made uncommon, recurring appearances since, especially in the Mario Party series. Three Amps circling around crystals in Super Mario 64. Amps make their first appearance in Super Mario 64 and are featured in several levels throughout Super Mario 64 and its remake, Super Mario 64 DS. Similar to Li'l Sparkies and Hotheads, Amps move around objects and platforms, and if Mario comes into contact with one of them, he will be shocked and lose one wedge of health. Amps cannot be defeated in this game. Amps can be found in Bowser in the Dark World, Shifting Sand Land, Vanish Cap Under the Moat, Snowman's Land, Bowser in the Fire Sea, Tick Tock Clock, Rainbow Ride, and Bowser in the Sky. While being electrocuted, Mario flashes and become immobile for about one second. Amps in New Super Mario Bros..
A model of an Amp. Amps reappear as an uncommon enemy in New Super Mario Bros., in World 3- , World 4- and World 7- . In this game, they appear mostly in groups, and if Mario comes in contact with one, he will be shocked. They can only be defeated with a Mega Mushroom, Koopa Shell or Starman. Amps lose their electricity for a moment if they shock Mario or Luigi, except for ones on fences, which disappear after shocking the player. Amps can also be found in many areas of Super Mario Galaxy, including the Buoy Base Galaxy, the Battlerock Galaxy, the Space Junk Galaxy, the Toy Time Galaxy, and the Dreadnought Galaxy. They have faces, and their eyes and mouth are both bright red. There also other Amps that are large, faceless balls, called Big Amps. Similar to Super Mario 64, Amps cannot be defeated. However, the second player can freeze them in place. They also appear in the Bubble Blast Galaxy where they move in groups of two. Amps as they appear in New Super Mario Bros. Wii. Amps also appear in New Super Mario Bros. Wii as rare enemies, behaving as they did in New Super Mario Bros. Only six of them appear in the first half of World 3- . They can be defeated by freezing them with icy projectiles from the Ice Flower or Penguin Suit and then Ground Pounding them, touching them with a character using a Star, or by having a frozen enemy thrown at them. The player(s) must dodge the Amps to reach the Red Coins. Two Amps from Super Mario Galaxy 2. Amps reappear in Super Mario Galaxy 2, behaving and appearing the same way they did in the predecessor. However, they can now be defeated by using a Rainbow Star. They appear in Sky Station Galaxy, Space Storm Galaxy, and Spin-Dig Galaxy. Amps in New Super Mario Bros. 2. Amps reappear in New Super Mario Bros. 2 for the Nintendo 3DS. They act just like they did in the predecessor and appear in the levels World 4-B and World Flower - . Additionally, Amps can also be seen moving on lines, like Fuzzies. 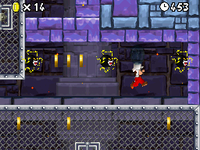 Amps in New Super Mario Bros. U.
Amps and Big Amps reappear in New Super Mario Bros. U, appearing only in Snake Block Tower and in Ludwig's Clockwork Castle. They behave like in the predecessor. There is also a new variation known as Bowser Stunners that conduct electricity with each other. They are one of the few enemies that don't reappear in New Super Luigi U.
Amps appear in various games in the Mario Party series, either serving as obstacles in minigames or as usable items. Amps make their first appearance in the Mario Party series in Mario Party 3, where they appear as the main obstacles in Motor Rooter. Indicated by shockwaves on the central map, these Amps form an electrical current that covers the path except for one tile, and they slow down players that are hit by them and their electrical currents. Players can avoid them by changing lanes to an area that is not covered with electricity. Mario Party 4 features the Sparky Sticker (Waluigi's favorite item) which is a sticker of an Amp that players can deploy on the ground to serve as a trap. Once deployed, it blends with the spaces, hiding until a player passes over it. When players pass over it, they lose ten coins as well as the effect of a Mini Mushroom and Mega Mushroom. Amps in the Mario Party 5 minigame Shock Absorbers. Amps are the main obstacle in Shock Absorbers in Mario Party 5, where touching one loses the minigame. Players are trapped in a small arena where there are multiple Amps that move around. As in Mario Party 3, these Amps can also form a line of electricity, where their indication to perform this attack happens when they stop in place and begin to emit electricity. Amps on the borders of the course form a permanent barrier of electricity. Amps appear in Mario Party 6 as the Zap Orb. Once a player passes over a set Zap Orb, they would lose five coins for each space they moved beyond it for the rest of their turn. Amps are the main enemy in the Circuit Maximus mini-game, where players need to make a lap around a circular course, where the number of Amps progressively gets bigger the more rooms players pass through. Some Amps are stationary while other Amps are moving obstacles. A notable Amp appears in Mario Party Advance, gambling in Town Game Room B. Generic Amps also appear in the minigames Amplifried, Cloud Climb, and Broom Zoom as hazards, where they continuously emit electricity that harms the player. In Amplifried, they serve as the main obstacles, where the main goal of the game is to avoid them. 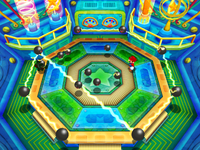 Their attack pattern in this minigame is somewhat similar to their appearance in Shock Absorbers from Mario Party 5, where they can move around and form electrical currents. As the minigame goes on, they move faster and form more electrical lines. In Cloud Climb and Broom Zoom, Amps are stationary obstacles, and touching them impedes the players' progress rather than defeats the players. Amps once again return in Mario Party 7, still in the form of the Zap Orb, which has the same effect as before. However, the player loses three coins for every space instead of five. An Amp in Mario Party 8. In Mario Party 8, an Amp is one of the nine enemies that are needed to be found in the minigame, Specter Inspector. It is found under a cover on the table. Amps appear in Mario Party: Island Tour in the minigame Amp My Style where they serve as obstacles for the players. In this minigame, a line of them forms an electrical barrier around the player, and these Amps can change positions to emit different shapes. Players who touch Amps and their electricity are eliminated. Amps are featured as one of the many enemy tiles in the minigames Match Faker and Tap Dash, where players can tap them if the game instructs the players to do so. Amps also can appear as a constellation in the minigame Starring Artist, where players need to redraw their constellation by connecting stars with their stylus. In Bowser's Wicked Wheel, a minigame from Mario Party 10, two pairs of Amps form electrical bonds at the left and, respectively, right sides of the running wheel, restraining the inner bottom surface as ground for the playable characters. The characters, who would have to constantly run in the wheel while Bowser rotates it, are thusly barred by the Amps, and will lose a heart upon contacting their dangerous links. As the wheel goes round to the left and the characters run to the right to resist getting drafted into the left Amp barrier, Bowser might suddenly stop the wheel and send the tormented characters towards the other Amp barrier on the right, due to inertia. Amps also appear in the minigame Kamek's Rocket Rampage; if the player comes in contact with one, they will lose two points and be stunned for one second. Amps appear as obstacles in the minigame Corkscrew Climb in Mario Party: Star Rush. Players need to jump over them as they automatically ascend a tower. If a player touches the Amp, the player is knocked out and sent to the back of the line of players. Additionally, they are the main obstacles of a mode named Challenge Tower, where they are hidden and if a player touches them, the player receives a game over. The tower's spaces light up in accordance to the number of Amps adjacent to the space, and Amps are never found directly next to each other. Amps appear in Super Mario Party, where they are obstacles in the minigame Half the Battle. Amps appear in Mario Sports Superstars as obstacles in boss battles with the Yellow Magikoopa in the Road to Superstar mode. Yellow Magikoopa can spawn them and toss them straight towards the cards. Amps originally sported white "cross-popping" veins, joyful red eyes, and rounded metallic lips with a pure red mouth. Since Super Mario 64 DS, their usual appearance has been changed a bit. They now have more jagged yellow eyes and a larger, jagged mouth. Their lips are now white, with a red tongue and dark red interior being visible inside the mouth. They are also now black rather than grayish and sport no angry veins. A black sphere buzzing with electricity. "All that crackling energy can't be healthy... Perhaps you'd better avoid touching these things." Birikyū From biribiri, an onomatopoeia for being zapped and kyū, "sphere". In the pyramid of Shifting Sand Land in Super Mario 64, there are two Amps that, instead of circling around objects, come out of walls in a circular pattern (thus circling nothing). However, these Amps do not appear in the DS remake. Mario • Luigi • Princess Peach • Princess Daisy • Wario • Waluigi • Yoshi • Toad • Boo • Bowser Jr.
Bowser • Champion • Power Precison • Precision • Random • Sorry! This page was last edited on April 23, 2019, at 03:55.